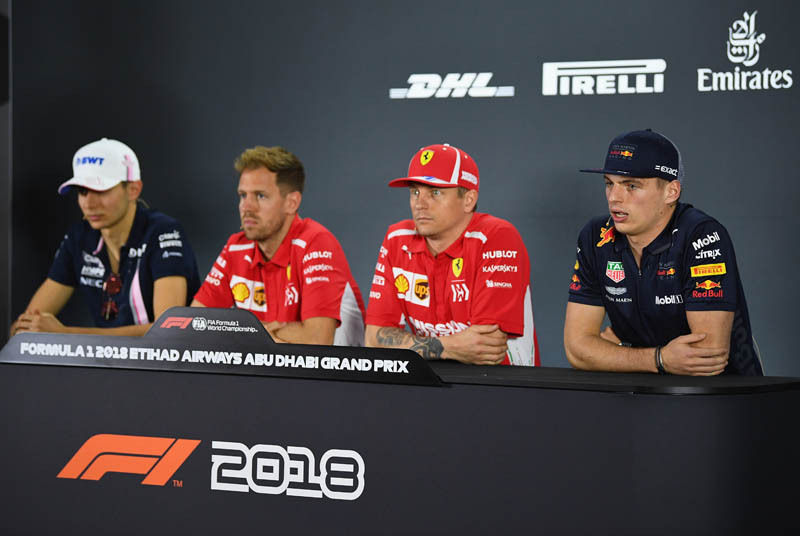 Part 2 of today's press conference with Esteban Ocon, Kimi Raikkonen, Max Verstappen and Sebastian Vettel. Q: Esteban and Max, it's been two weeks since you guys were involved in a collision at the Brazilian Grand Prix. Max, let's start with you: is that now water under the bridge? Max Verstappen: You guys like the drama, don't you? Like two weeks after. Yeah, no, all good, in the sense that you can't change the result. It's of course unfortunate. It's always a bit weird to crash with a backmarker but that's how it goes. Q: Would you do anything differently if the same situation arose? MV: No, I wouldn't, because from my point of view, how I look back on it is that I just passed Lewis for the lead and this season, it has been a lot about tyre management so as soon as I got into the lead, I was basically just cruising to save the tyres and somebody comes out of the pits and has fresh supersoft tyres, I think it was at the time... In general, I think this season Force India has been at least a second to a second and a half behind us. For two laps, maybe, you feel like you have decent pace but the guys in the lead are most of the time not pushing flat out to get somewhere, because once you in the lead, what do you want to do? So maybe you want to try and get past and then try and pull away but within two laps your tyres are gone, or at least, the peak has gone and you end up letting us by again so at the end of that whole process, to try and get by you're anyway also destroying your tyres in a way so I think it's always better to just stay behind and follow. Clearly that was not the case. Q: Thank you Max, and Esteban, how do you reflect on it? Esteban Ocon: Yeah, it's not a great thing, you know, to be involved with a crash with the leader, of course. It's not a thing you want to see and I'm sorry for Max. It was his race to win, he did a fantastic job during the whole race but yeah, on the other side, I had a slow pit stop so I came out in between Lewis and Max. got the blue flag after a couple of corners. I got away from the blue flag and I was quite fast and behind Max so I was stuck and then the team came onto the radio saying 'you can unlap yourself if you want and if you are faster' and as Max said, he was managing the tyres so yeah, I just went for it. It was important for us to get close to the top ten pack. If something happens, you know, a penalty or anything, I could have got in the points. Things that happen, you can't come back from what has happened but yeah, that's how it is, we have to move forward. Q: Max, coming back to you, this is the team's final race with Renault engines. Just how excited are you about the future with Honda? MV: I'm very excited but the whole team is. You can really feel it. I think it's good that the whole team is super-motivated for next year. We know that we can build a great car. Of course we are just waiting to have the whole package together but I definitely feel a difference compared to the last years where... the motivation was there, everybody was always trying to do their best but now they're just so looking forward to next year that I think next year, to have that extra motivation will definitely help us to be more successful next year. Q: Esteban, coming back to you; we now know for certain that you won't be racing in Formula One next season. What does 2019 hold for you? EO: Yeah, we'll see what it holds for me. Definitely I will be around in the F1 paddock and trying to get as much mileage as possible in a Formula One car next year. Me and Mercedes, we see great opportunities for me to come back in 2020 so hopefully that will be the case and hopefully I will be back even stronger than I am now. Q: Have you had any assurances from Mercedes about 2020? EO: No, assurances, no. You never have but as I said, we seen great opportunities so hopefully there will be. Sebastian Vettel: I think it's what everybody tries to do but certainly after a season with highs but also with lows I think it would great to finish on a high. SV: I think we need a stronger package. We certainly have had our moments this year when we had strong races but we also had races which weren't very strong, we weren't quick enough, so I think overall it's the speed that decides and I think more often than not I think we're lacking a little bit of speed. I think we're working very hard and I think the motivation is there to do that final step that is still outstanding. Q: Kimi, after eight seasons, this is your final race with Ferrari. What does this team mean to you and what will you miss most about it? Kimi Raikkonen: I don't know. Obviously I had this leaving them once already so it's not a new thing. I'm not sad because I don't see why we need to be sad. We will stay as friends. We're going to see a lot of us anyhow in the paddock so not an awful lot changes. We'll both go for new things and I think it's exciting but we've had good times with the team, great people. We've had some difficult times, but that's part of business and I think that's how it should go: sometimes it needs to be a bit hard. No, obviously I won the championship with them, as a driver. We twice won the team (championship) so I'm very happy to be part of it because there's not many people who have done it. We will happily go different ways. We're not that far away from each other and we will keep doing what we do. Q: And just looking at this weekend, you're in a tight battle with Bottas, just 14 points separating you in the championship. How important is that third place for you? KR: I don't think it's changing my world any way. If I end up third, I think we need to go wherever the prize giving is so it's a negative thing in the end, you know, more travelling but we'll see. Q: (Andrew Benson - BBC Sport) Esteban and Max, we all know there's a bit of history between you two. How do you feel about each other as drivers and as men, and about the prospect of racing together potentially for a long time in Formula One? MV: OK, with all the other young drivers? Oh. We've done that in go-karting so that's life. Q: (Andrew Benson - BBC Sport) All I'm asking is how do you feel about each other as drivers and as men? MV: Yeah! Well, I don't know. It's like a neutral feeling. EO: I will respond, if he cannot, I do. We've been racing since a long time and it's been close racing on track. Sometimes there were touches but you know if you're fighting for championships or stuff it's always the case. Anyway, it gets close at some points but the important thing is that it stays good racing and good fun for the fans but doesn't go over it and that's the important thing, yeah, but it's been a long time that we know each other and it's been good so I don't see why it could change. MV: I have the same feeling racing Esteban or Seb or Kimi. It's not because he's a lot younger than them that changes my feeling or anything. Q: (Dieter Rencken - Racing Lines, Racefans.Net) Max, Will Buxton, the F1 TV reporter has just tweeted: 'tell you what, Max ain't over it. Not one bit. Doubled down on it being intentional on Ocon's part. Blimey.' Did you do a TV interview with him where you possibly suggested that Esteban did it intentionally? MV: I don't care about what's written on twitter so... no. 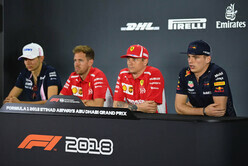 Q: (Jerome Pugmire - Associated Press) Max, at the start, you said you guys like the drama but obviously the drama is heightened by what happened after the race where you pushed Esteban three times. If you could go back again, would you have the same response? Do you regret your response? MV: No, not really because I was after an apology and I got a bit of a different response. We are all emotional, just at the time that I had lost a victory, so I think from my side I was really calm. It could have been much worse. I think pushing, in any sport, it happens. I actually saw it a few days ago in football again. So from my side, I thought it was quite a calm response. What do you expect me to do, like shake his hand, like thank you very much for being second instead of first? I think it's quite a normal response. OK, I got my two days with the FIA which we will find out what we're going to do but no, from my side... You guys don't really hear what's actually being said at the scales. You just see me pushing. But if you understand the whole conversation, I think it's a bit different. SV: We can go? Now? I don't know. I have an opinion. I'm not sure I should say what I think. KR: Not really. I saw it afterwards. Boys and boys and that's how it goes. I don't think anything bad happened in the end it's probably in many eyes, if you take the whole picture, maybe it's not the greatest thing in many aspects but it's not the end of the world. That's how it goes. Check out our Thursday gallery from Yas Marina, here.